(Newser) – Want to exercise longer without feeling wiped out? 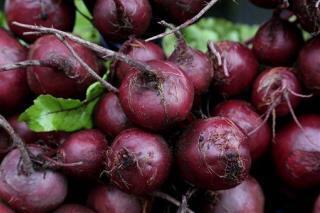 A new study suggests adding beet juice to your diet. The research, published in the American Journal of Physiology: Regulatory, Integrative and Comparative Physiology, zeros in on nitrate, which is found in beet juice and converted to nitric oxide in the body; the molecule has the ability to more easily dilate our blood vessels and increase blood flow. A press release on the study explains exercisers who consumed beet juice experienced this effect both while doing a progressive cycling exercise and while at rest. Blood pressure was lowered and the heart needed less oxygen during the workout, which led researchers to conclude that beet juice is "capable of enhancing O2 delivery and reducing work of the heart" so exercise can be "performed at a given workload for a longer period of time before the onset of fatigue." Beets are wonderful when properly prepared. I love beet-carrot-celery-ginger juice. I also make a rich broth based on beets and all the other root vegetables I can find. For beet salad, a light dressing with rice vinegar is good.